Scenes from a Junkyard Planet: Your American Recycling Bin, Transported. During the run-up to the November 12 release of my first book, Junkyard Planet: Travels in the Billion Dollar Trash Trade, every weekday I’m posting a new photo taken during my decade of reporting on the global waste, recycling, refurbishment, and repair trade. Click for an enlargement. 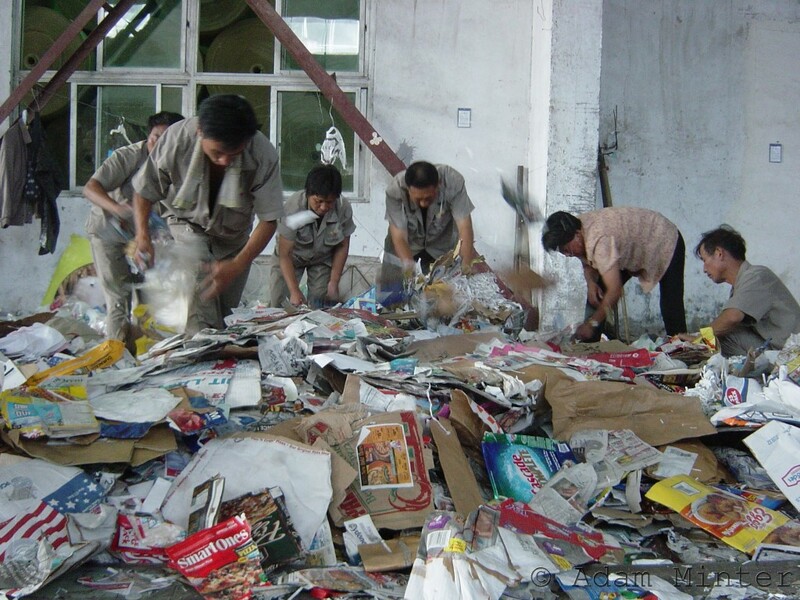 A humid day in 2004, almost 250 miles inland from the nearest port, workers at a paper mill in China’s Henan Province search newly arrived US scrap paper for plastic, metal, and other items that might damage the company’s (then) newly purchased European paper-making machine. This was one of the first paper mills I’d ever visited, and I was overwhelmed by the heat – and the ability of the workers to function in it. Previous ‘Scenes from a Junkyard Planet’ can be found here. This entry was posted in Junkyard Planet, Scrap by Adam. Bookmark the permalink.